Line a sieve with cheesecloth, pour in the yoghurt and fold over the edges to cover completely. Place the sieve over a bowl and put in the fridge for 12 hours to strain. Put the saffron into a small bowl, add about two tablespoons boiling water. Steep for lìve minutes. 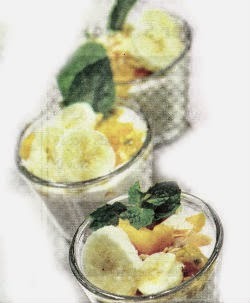 Put the drained yoghurt into a bowl, add the steeped saffron, honey, and cardamom, and stir well. Pour into individual sewing bowls, sprinkle with toasted almonds and berries, and serve. It takes more than grilling meat to make good satay. It look easy.. thread little pieces of marinated meat through bamboo skewers, grill them over fire and serve with nasi impít, cucumber, onion and peanut sauce. 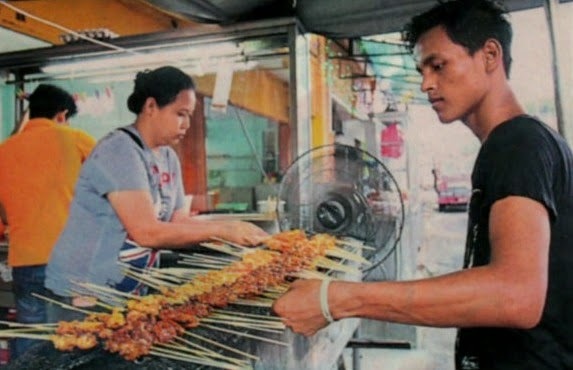 Pendek Satay's skewered meats are only cooked once an order has been placed while no meat is taken out from the kitchen to be left near the grill to avoid contamination. But if you were to talk to a satay seller, and l mean really engage him in conversation, he would tell you it’s not easy to make great satay. First, there is the meat. Discerning cooks complain about the poor quality of meat sold in thel pasar. But if you have to sell a stick of satay for just a few sen, you can’t afford to use air-flown beef, right? However, we found some satay establishments which bucked the trend in their quest to make great satay. “We only use the best quality meat,” said Kassim Hamid of Pondok Satay in USJ8, Subang Jaya and asked: “Do you know any business that uses tenderloin to make satay?" “We use tenderloin. It is more expensive than the other cuts,.but We are willing t0 bear the cost because tenderloin is tender and makes satay." For his satay, Kassim uses chilled Indian beef and chilled Australian lamb and mutton - in other words, air-flown meat. (The chicken is local.) His beef satay sells for just 95 Sen, the lamb and mutton for RM 1.20 and the chicken for 80 Sen. Nearby the Pudu Wet Market lies this eatery that has made a name for itself over the past 25 years. The owner uses a two-way heating system by cooking the rice in a claypot and placing more hot coals on the lid to help lock in moisture and the chicken's flavours. A secret marinade sauce is also used for the chicken pieces. Business hours: 11am -9:30pm. Closed on the first and third Thursday of the month. Non-halal. This Chinese restaurant features monthly special menus, modern food presentation and a cellar filled with hand-picked New World wines. Executive chef Oh Ah Poh is respected for his culinary mastery gained through 40 years of experience. Among his dishes are Farm Duck Salad, Padi Field Crab, Mirror Pairing Scallop Plate and Australian Wild Abalone and Fish Maw. Business Hours: 10:30am - 2:30pm, 6pm-10:30pm, daily.